Since last Sunday’s Grammys ceremony, featuring Skrillex’s hat trick (but, alas, no Best New Artist trophy) and a colossal head-scratcher of a spectacle featuring dance icons David Guetta and Deadmau5, one question has come up repeatedly across Internet message boards: What does it all mean for electronic dance music? I’ll tell you: not much. But not for the reasons you think. Being a denizen of dance music’s numerous niches for most of my professional life, I’ve done scads of these state-of-the-scene snapshots, and if there’s one thing I’ve learned, it’s that there is no one thing we can conveniently bundle up and call “electronic dance music.” There are a million little scenes, sounds, tendencies, ideals, ethics — some at odds, some running in parallel, some overlapping in strange ways. Consider just one example of the ways that dance-music cultures exist on planes so distant that you’d need quantum physics to map them: I live in Berlin, which means that in order to watch the Grammys, I needed to wake up at 5:30 Monday morning here to tune in to the live broadcast. At that hour, a few kilometers from my apartment, the last stragglers were leaving Berlin’s Berghain, widely considered the world capital of underground techno. That’s right: 5:30 in the morning on a Monday, the clubbers are still at it. It’s hardly uncommon here to wake up on a Sunday and head to Berghain for a breakfast of Red Bull and vodka, then dance away the afternoon, evening, and whatever comes next. In fact, that’s a local point of pride; arriving at a club before six in the morning is what tourists do. Inside the club, a mixed clientele dances to an adventurous blend of vintage house, cutting-edge techno, and everything in between. DJs are expected to take risks in their sets, and they’re given up to eight-hour time slots for that very purpose. There are no spotlights on the DJs, though, and no go-go dancers. All of the energy is on the music, on the dance floor, in the pulse in your veins and the sweat on your forehead. What had looked like a bad idea on paper, before the ceremony, turned out to be a train wreck in practice. I know it’s not cool to get too hung up on “authenticity,” but this was not what dance-music culture looks or feels like. Most DJs and laptop performers actually do something onstage. What does “dance” music in American look like right now? Check out photos from last year’s Electric Daisy Carnival. About that Foo Fighters appearance, something made all the weirder by Dave Grohl’s frequent fuming about how computers have no place in “real” music: What on earth were they doing there? Were they a sop to viewers who would otherwise be turned off by the presence of a DJ onstage? Were the show’s producers going for a history-making genre crossover on the scale of Aerosmith with Run-DMC? Not only did they not hit that; they didn’t even manage Judgment Night. It was the worst kind of synergy — tacked on, instead of truly integrated. It was awkward, and it made everybody look bad, not least Grohl, who the cameras caught rather grimly bobbing in place while Deadmau5 finished up the set. Of course, you can tell me that I’m taking it all too seriously, that it’s just entertainment, a bit of spectacle. But the segment showed a total disregard for any of the things that make electronic dance music vital and exciting and innovative. It’s true that, given the format, it was bound to fail — a dance-music DJ needs hours, not minutes, to get across his or her ideas. But, given the constraints they had to work with, why couldn’t they have showcased someone like Araabmuzik, the trance-sampling MPC virtuoso? Or Robyn, who not only has a compelling stage presence, but knows how to translate her studio creations convincingly to the stage? Hell, why not at least have invited Skrillex up there? His performance might not have been any more “live,” but at least he’s got personality, where Guetta simpers and Deadmau5 sneers. 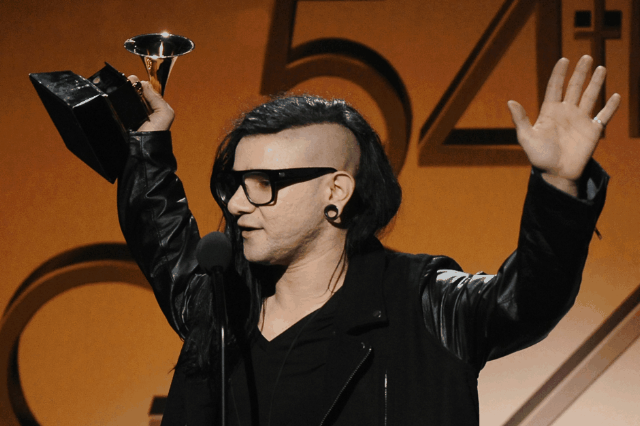 One Skrillex shout-out in particular stood out, to “all the Croydon dub guys that started this all in 2003.” He was talking about dubstep’s originators — people like Skream, Benga, and Artwork and all the DJs that came through Big Apple records in Croydon, South London, which served as a hub for the scene in its earliest days. A cynic might say that Moore was just trying to ride their coattails, but I thought it came off as a genuine sign of respect, even (especially?) given that Skrillex’s music has little to do with the template that they established. There was a lesson here, too, if any members of the Academy were listening: Wherever electronic dance music goes next, the seeds are being sewn in places like Croydon, Berlin, Brooklyn, Lisbon, and further afield — but not, certainly, at the Haze Nightclub at Staples Center. Read our Skrillex cover story here.